This Fall's attendees at New York's Bridal Fashion Week were treated to the newest and hottest trends in bridal fashion. The great news is that all of these trendy, new looks can be achieved or simply embellished by the use of bridal appliqués. You too, can create distinctive, one-of-a-kind wedding couture, incorporating these six ideas, straight from New York's most stylish runways and designers! Transparency Using Illusion Fabrics: Brides were showing a little more skin with baring, yet subtle touches strategically positioned at the back, chest and legs. Serious Sparkle: Gowns were glistening and dancing with stunning detail or overall eye-catching shine. Lingerie-Inspired Gowns: Lingerie detail appeared in varying dress lengths, from short to trailing, incorporating spicy details like plunging necklines, corseting and lacy highlights. Bold, Experimental High-Fashion: From giant ruffles to cage-skirted ball gowns, Victoriana reigned supreme, but daring new silhouettes were displayed in abundance. The detachable skirt took brides from ceremony to celebration in one transformable outfit! Incorporation of Floral Details: 3D flowers, posey prints, flowing trains and embroidered accessories took flight with feminine fancy. Showy Sleeves: Fluttery, strapless, off-the-shoulder and balloon sleeves were just a sampling of creative possibilities for dressing up the arms and shoulders. You need not limit your appliqué artistry to the woman of the hour. A wedding is the bride's special day, but the wedding party deserves a touch of flair, as well. Wedding remembrances and accessories, such as photo albums, clutches, centerpieces or corsages are only made more unique and special with appropriate appliqué enhancement. Don't forget the mother of the bride! Contact us for the ultimate selection of appliqué for every occasion. 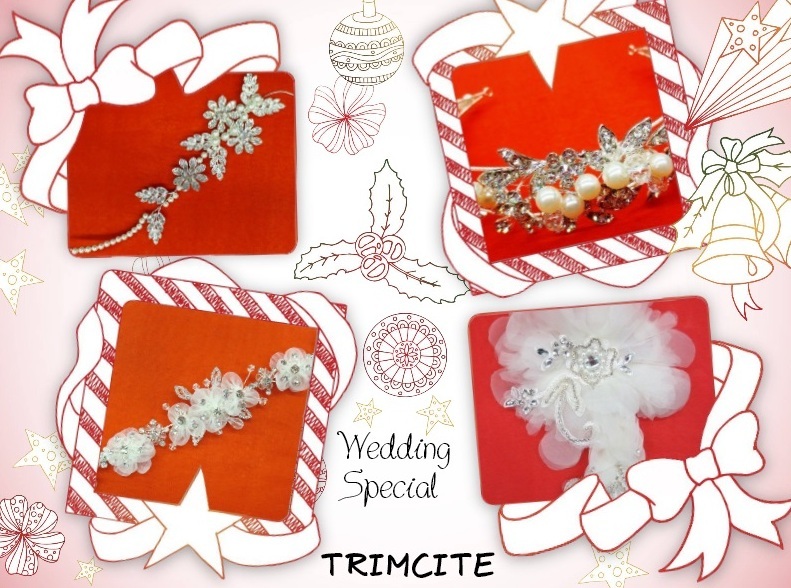 TrimCite has hundreds of appliqués, incorporating a multitude of fashion-forward materials and designs for every wedding whether formally elegant or casually chic.